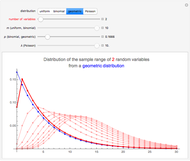 Let , …, be a random sample from a probability distribution. Let and be the smallest and the largest value in the sample. The sample range is , that is, the difference between the largest and the smallest value. The sample range is a crude measure of the variation in the sample. 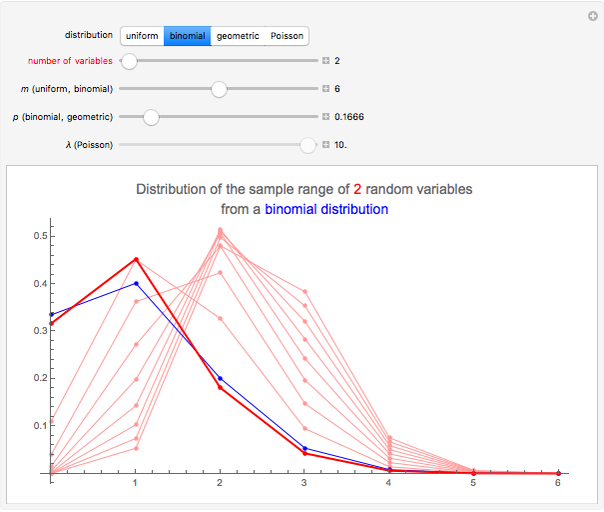 The Demonstration shows the distribution of the sample range, when the sample is drawn from some well-known discrete distributions. Snapshot 1: The sample is drawn from the discrete uniform distribution on the integers ; the blue line is the probability distribution function (PDF) of the discrete uniform distribution. Each of the red curves is the PDF of a sample range: the dark red curve is the PDF of the sample range when there are only two observations. The light red curves are the PDFs of the sample range when there are 3 to 10 observations. For example, toss a die several times. With two tosses, the sample range (the difference between the results) takes on, with high probability, values from the set , say. Here it is less probable that the range is 0 than, say, 1; this is natural since, to get a range of zero, the results must be the same (only 6 possibilities out of 36), but to get a range of one there are more choices (10 possibilities out of 36). 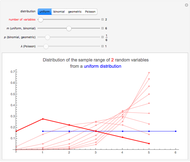 For three tosses, the sample range takes on, with high probability, intermediate values . On average, the more tosses, the larger values the sample range takes on. For example, with 10 tosses, the sample range (the difference between the largest and smallest result) takes on, with high probability, values from the set , say. Snapshot 2: The sample is drawn from the binomial distribution: we repeat an experiment six times, each experiment being a success with probability 1/6. For example, toss a die six times and count the number of 6's; do this series of six experiments repeatedly. Repeating the six experiments two times, the sample range (the difference between the number of 6's) takes on, with high probability, values from the set , say. Repeating the six experiments 10 times, the sample range (the difference between the largest and smallest number of 6's) takes on, with high probability, values from the set , say. 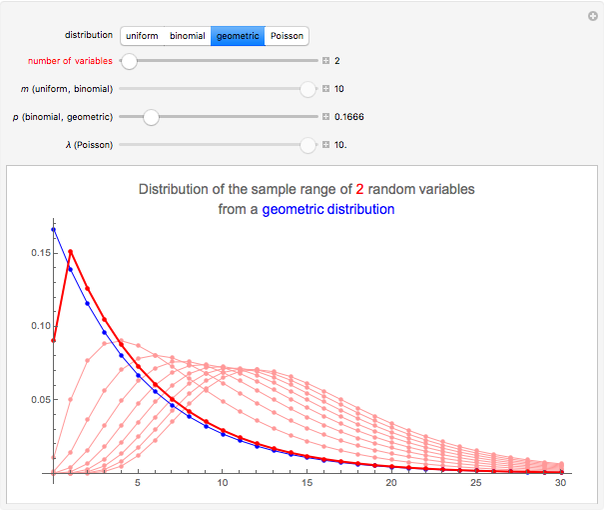 Snapshot 3: The sample is drawn from a geometric distribution with the parameter . For example, toss a die until you get 6 for the first time. Count the number of failures, that is, the number of tosses that precede the first 6. Repeat this series of experiments several times. The distribution of the sample range for two series of experiments (the difference between the number of failures) takes on, with high probability, values from the set , say. For 10 series of experiments, the sample range (the difference between the largest and smallest number of failures) takes on, with high probability, values from the set , say. 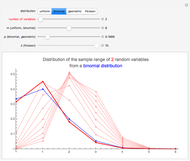 Snapshot 4: The sample is drawn from a Poisson distribution with mean 5. For example, assume that the number of certain kinds of accidents in a given city in a day has this distribution. Consider the number of accidents in several days. For two days, the sample range (the difference between the number of accidents) takes on, with high probability, values from the set . For 10 days, the sample range (the difference between the largest and smallest number of accidents) takes on, with high probability, values from the set , say. where is the support of the distribution. This formula is used to calculate the distribution of the sample range for the binomial and Poisson distributions. 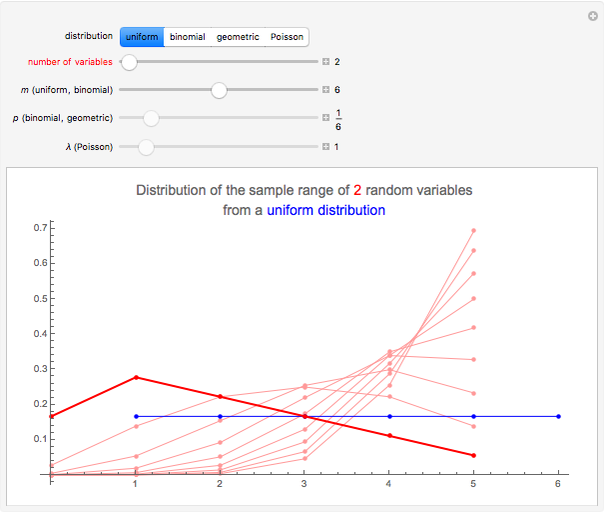 For the uniform and geometric distributions, we have simpler closed-form formulas in [1, pp. 51, 52]. Heikki Ruskeepää "Distribution of the Sample Range of Discrete Random Variables"